FASTER FUTURE: Decathlon Singapore Lab opened in January 2019 as a test bed for innovative retail solutions. 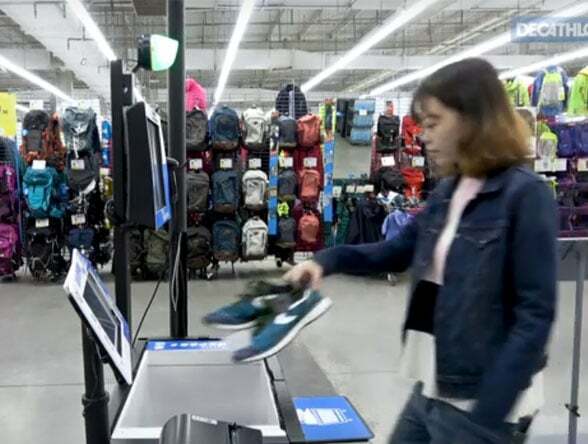 Sports retailer Decathlon is using a combination of RFID tags and mobile payments to enable customers to use self-checkout kiosks at its newest store in Singapore without needing to scan the barcodes on the items they have placed in their shopping basket. To use the service, customers place an item into a boxed area on the self-checkout kiosk so the RFID tag on the product can be read and the item’s price and details captured. The customer then removes the item from the boxed area and adds the next one. If an item is not recognised, the customer is advised to scan the barcode instead. They then review and verify their order before using the kiosk’s touchscreen to pay using Singapore’s Nets electronic payments system. According to Yves Calude, chief executive of Decathlon Singapore, the retailer has named the 5,000sq m store Decathlon Singapore Lab to highlight its disruptive and innovative nature as a test bed for new solutions. Features showcased at the store include zones in which shoppers can play basketball and different surfaces on which they can test running shoes, as well as a number of technological innovations. The RFID tags also enable the retailer to pick and fulfil online orders. Orders can be delivered direct to customers in two hours or collected from the store. Decathlon Singapore Lab opened in January 2019.